New York yeshiva students protest outside Queens home of Nazi concentration camp guard Jakiw Palij. 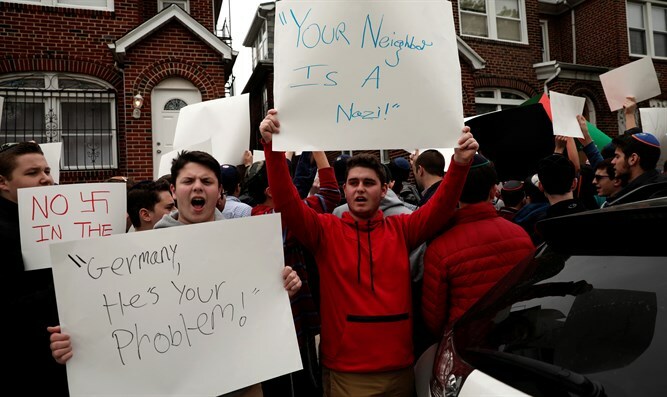 Yeshiva high school students held a protest this week outside of the home of a Nazi concentration camp guard now living in Queens, New York, demanding the man be returned back to Europe. The Polish-born Jakiw Palij, now 92, was recruited in 1943 at age 18 to help operate the Treblinka concentration camp, working as a guard. According to Justice Department special investigator Eli Rosenbaum, Palij played an important role in the operation of the Treblinka camp, describing him as “an essential component in the machinery of annihilation”. Four years after the war ended, Palij immigrated to the US, posing as a farmer, before being naturalized in 1957. When the truth of Palij’s activities during the war came out years later, however, Palij was tried as a war criminal, and in July 2003 a US federal court stripped Palij of his US citizenship. In 2004 a federal court attempted to deport Palij, but after all three potential destinations – Germany, Poland, and Ukraine – refused to accept him, the orders were cancelled. Over the past decade and a half, Palij, who now lives off of Social Security payments, has been the target of protesters demanding his removal from the US. During Holocaust Remembrance Day on Monday, protesters from the Rambam Mesivta yeshiva high school in Lawrence, Long Island, congregated outside of Palij’s home in Queens to protest his continued presence in the US. “It is outrageous that a Nazi who is involved in killing thousands of innocent men, women and children should be able to walk the same streets that we do,” 17-year old student Benjamin Kattan told the New York Daily News. The school’s dean, Rabbi Zev Friedman, backed his students’ actions, saying the enormity of Palij’s crimes could not be ignored, regardless of his age.